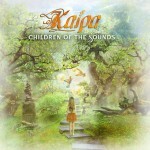 Share the post "Album review: KAIPA – Children Of The Sounds"
According to Cambridge Online Dictionary, inspiration is defined as “the use of imagination or original ideas to create something”. The artists of the ancient world believed that their abilities came from the Gods and prayed to them for their assistance. Luckily for Hans Lundin, founder of the Swedish Progressive Rock outfit Kaipa, no divine intervention (as far as we have been told) was required for the creation of “Children of the Sounds”, his band’s latest studio album. A few long bicycle rides in Uppsala, Sweden’s fourth largest city, and a visit at a ‘Mats & Morgan Band’ concert were enough to help the keyboard & vocal maestro put together the five compositions which are featured in this great sounding record. Melody is a very important ingredient in the making of Kaipa’s thirteenth studio album but that should not scare fans of traditional and modern Prog Rock away, as Lundin and Co have ensured that there is fusion of enough different styles and sounds (see classical, jazz & folk) to keep fans of bands like Yes, King Crimson and Dream Theater satisfied. These very beautiful vocal, guitar and keyboard-led melodies and the way they interact and achieve a striking balance with Jonas Reingold (Karmakanic, The Tangent) and Morgan Ågren’s (Casualties Of Cool, Fredrik Thordendal’s Special Defects) intricate rhythmical offerings is what makes “Children Of The Sounds” so damn special and an instantly/dangerously addictive musical proposition. Introduced by an ethereal wind/string classical arrangement and featuring layers of melodic vocals dominated by Aleena Gibson’s powerful pipes, the same titled “Children Of The Sounds” may be the most melodic piece of the album but its eleven and a half minute duration and its various references to the works of Yes are enough to convince of its progressive credentials. The even lengthier follow up opus “On The Edge Of New Horizons” finds the rhythm section of Reingold/Ågren in blistering form, features guitar and keyboard solos of immense quality, and strikes an interesting contrast with “Like A Serpentine”, the last truly long composition of the album, which focuses on Patrik Lundström’s (Ritual) & Aleena Gibson’s highly emotional vocal performances. The last two compositions are varied and impressive in equal measure. In the Folk-sounding “The Shadowy Sunlight” the band presents us with the most dark/introspected composition on offer while “What’s Behind The Fields” concludes the album with melodic passages and flamboyant solos created with the average Steve Howe (Yes) in mind. There’ s no denying it; I am pretty infatuated with Kaipa’s latest album. The melodies employed here make one’s attraction to the five compositions on offer immediate while the technical abilities of the sextet, and the way they are utilized, are more than capable of keeping the listener hooked throughout. This entry was posted in ALBUM REVIEWS, All Posts, PURE METAL (All posts), Pure Metal/Album reviews and tagged album, Children Of The Sounds, Kaipa, prog, Progressive Rock, review, rock. Bookmark the permalink.